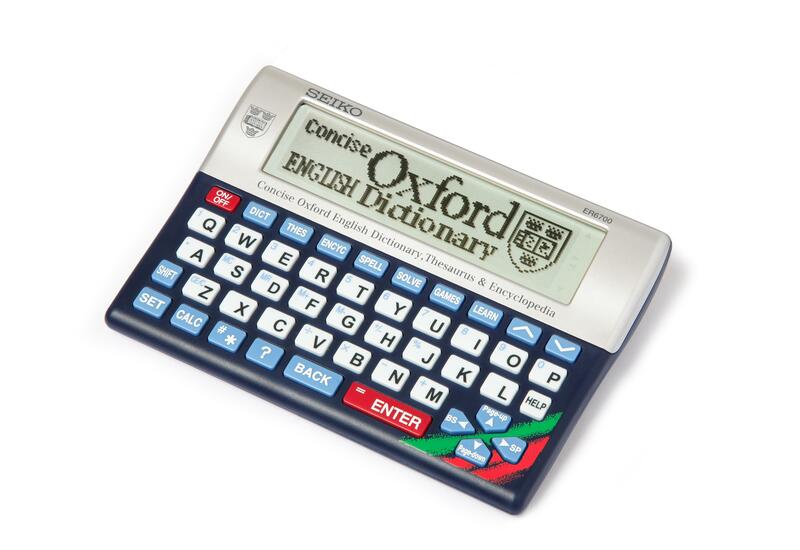 This electronic dictionary contains the full contents of both the Concise Oxford Dictionary and the Concise Oxford Thesaurus in one compact and easy to use product. Also included in this new model is the Oxford Concise Encyclopedia with over 12,000 entries including coverage of science, technology, sports, geography, architecture, and many more, as well as concise biographies of internationally famous world figures. This electronic edition of the Concise Oxford English Dictionary contains over 240,000 words, phrases and definitions, including 900 new words. It offers rich vocabulary coverage, with full treatment of World English, rare, historical and archaic terms, as well as scientific and technical vocabulary and provides hundreds of helpful notes on grammar and usage. The new edition of the Concise Oxford Thesaurus provides updated and improved text, new choices of synonyms, and a newly designed Wordfinder feature. The Concise Oxford Thesaurus is a comprehensive reference work for the home or office and is the perfect tool to use to improve your writing style, whether you are composing a letter, essay or report. It is also great for finding the word on the tip of your tongue and an indispensable tool for solving word games. The Oxford Concise Encyclopedia is lively, accessible, up to date, and an invaluable quick reference work. Its clear and concise style makes it simple to find information on a vast range of subjects quickly and easily. Over 12,000 entries include coverage of science, technology, the arts, politics, sports, geography, folklore and mythology, inventions, architecture, literature, design, philosophy, and many more, as well as numerous concise biographies of internationally famous world figures. Dictionary – High speed search of over 240,000 words, phrases & definitions covering current and historical English, as well as countless specialist and technical subjects. Crossword Solver – Enables you to complete those hard to finish crosswords. Anagram Solver – Type a word or a jumble letters and the solver will build a list of as many valid words as possible. Calculator – with memory & percent. 190 metric/ imperial & currency converters. Meets GCSE and National Curriculum needs.